When you apply for and are awarded a scholarship from our scholarship fund you receive philanthropic dollars to support your pursuit of a career in the nursing or allied healthcare professions. 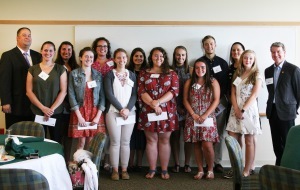 Multiple scholarships are available to deserving students and Concord Hospital employees pursuing careers primarily in nursing and, on a limited basis, to students pursuing careers in various qualifying fields of allied health care. To be considered, applicants must submit the online application and all supplemental documentation no later than April 30. Scholarship awards typically range from $1,000 - $3,000, and award recipients are notified by mid June. Nursing student Patrick Dineen talks about how our Scholarship Fund helped him pursue his career goals.